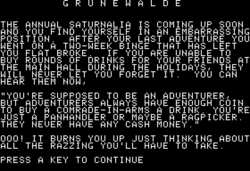 Grunewalde is an Eamon adventure written by Pat Hurst. Originally released on two diskettes, it was subsequently pared down to one. This page was last edited on 4 September 2018, at 05:29.